These are common problems when you have a virus in your computer. The viruses you can clean with a good antivirus software. But sometimes, even you scan your computer with antivirus there are some “leftovers” that can slow down your system. Here we talk exactly about this type of process that slow down your pc on the way that overload your cpu to 100%. This you can see if you open Task Manager by pressing ALT+CTRL+DELETE buttons. By clicking on the Processes tab, you can all your active processes. There are couple svchost.exe processes, but the one that we are afraid of is the one that overload the cpu. 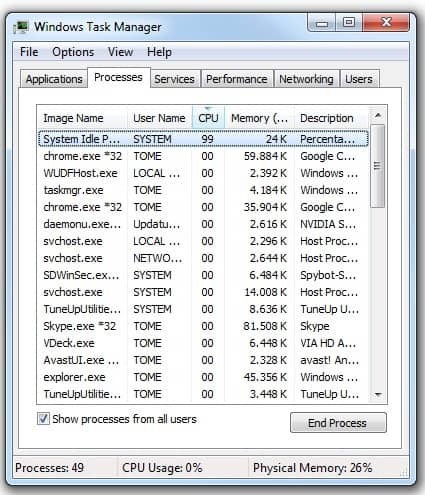 By clicking to sort the processes by CPU usage, we can see the one that overload the PC. If you determine that you have this problem also, we have a solution for you. Run the file SVCHOST FIXER by clicking double click. Wait until the whole operation is done. The window will close itself after everything is done. Restart your PC in normal mode and it should be OK. Check again the Task Manager.